This hashtag promised all manners of things before the event. 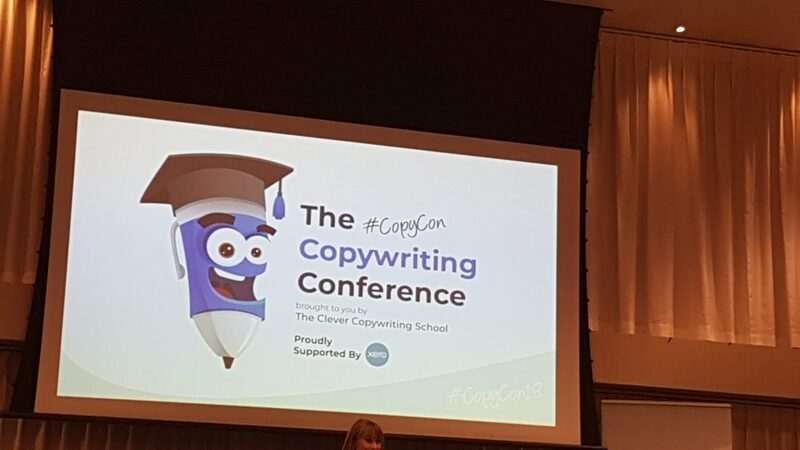 After attending my first conference for copywriters organised by Australia’s favourite copywriter, I’m thrilled to say the event delivered what it promised – in content, in vibe and and in valuable business info. Usually, the word conference + networking sends some shivers down my introverted copywriter spine. With #copyconau I needn’t have feared. From the time I walked into the event to the time I left (most reluctantly I might add), I learnt heaps, chatted with fellow copywriters who I only knew from online (didn’t feel like it though as we all hit it off straightaway). It was an event with a difference – and definitely not to be missed in the future. I know I’ll have serious FOMO if I don’t go to Melbourne next year for #copycon19. For those copywriters who missed out on this amazing event, here are some business gems I took away from my time on Saturday 5 May, 2018. “My business looks very different now to when I started,” said Kate Toon, Copywriter and Founder of The Clever Copywriting School as she started off the first presentation of the day. If you’re a writer, then accepting evolution is part of the game. Your business will not stay stagnant, nor it should. Like a baby, it will grow. You are in charge of what direction you want your business to go. Running a business is hard work, trying to create passive income is even harder. To have a successful business, you need the right processes from the beginning so you save time and focus on the fun stuff: the writing. Which ice-cream delivers sublime happiness to the eater? Plain, boring vanilla or burnt caramel, fig and honeycomb ice-cream? Yes, ice-cream analogies were brought out by the ever-practical Kelly Exeter when it came time to share the importance of strong editing on content. You need to give yourself time between writing a first draft and editing it. Never write and edit on the same day. Always present one idea per article. Too many ideas in one content makes it confusing for the reader. There must be a payoff for the reader in reading your content. What have you delivered that makes it a satisfying read? If you want to break an editing rule, do it with intent. Remove all the roadblocks in your content. Roadblocks like big words, lose readers instantly. Always use small words. Don’t do social media without a solid strategy. Go where your customers are even if it’s not the most popular channel. Cherie Clonan, The Digital Picnic. Put yourself first, Tegan Ang, copywriter from Writing your story (one of my favourite presentations of the day). I’ve been following Joanna from Copyhackers (online!) since I heard her talk on the Hot Copy Podcast. I’ve been dabbling in conversion copywriting but after hearing her speak, it’s really sparked my interest. Top tip: Conversion copywriting is a 4-step process: Listening, writing the content, testing and validation. Listening is the most important part of conversion copywriting. Joanna provided some interesting ways of tapping into your target audience’s thoughts e.g. reading product reviews and using your customer’s words to connect in your copy. So that’s a wrap for #copycon18. Wonder what #copycon19 will bring? I, for one, can’t wait to find out.